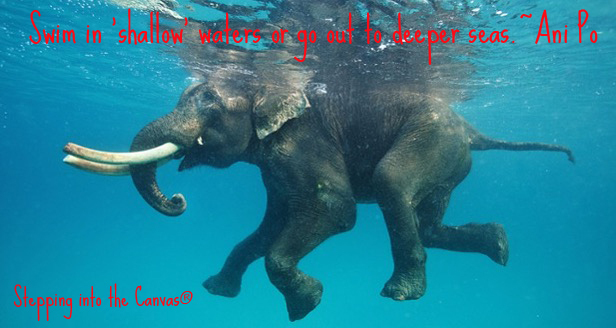 We can swim in ‘shallow’ waters or go out to deeper seas. The depth of our Canvas depends on our desire to swim. Our ability to stay afloat or swim across the shores dependent on our willingness to swim. We can let mud settle to the bottom of ocean, allowing waters to clear…only to be kicked up as we swim away. Clarity may be present but sediment still remains. Swim even faster, while appearance states clear…sediment still remains returning to origin of self. Some may call in a dredger, sucking sediment from the bottom. Yes, clearer the water may be but worry of clarity remains. Fear remains until we accept muddy waters, sediment of self and waters invitation to swim to open waters.